See the exhibition that was officially launched, and viewed by thousands, at the RNZAF’s 80th Anniversary Air Tattoo at Ohakea. On display throughout the Museum. This landmark project has been created to celebrate the 80th anniversary of the Royal New Zealand Air Force (RNZAF). In its entirety, it features a diverse selection of 80 individuals, as a representation of the many thousands who have served with the RNZAF throughout its history. Each figure has been selected to give a personal insight into the many different elements of our Air Force’s history and is supported by a historical date point to provide context. Unlike a traditional exhibition, '80 Years in 80 Stories' is not confined to a single space. 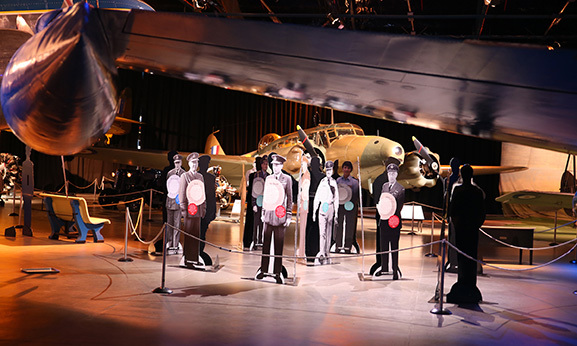 You will discover many of the life-sized figures dispersed around the Museum's galleries, each standing alongside an aircraft or another artefact which is connected in some way with their story. The figures are in no particular order – you will find aircraftmen and air vice-marshals, pilots and ground crew, and perhaps even a squadron mascot or two. All have contributed to making the RNZAF the richly diverse service it is today. '80 Years in 80 Stories' was a finalist in the Service IQ New Zealand Museum Awards 2017. Meet some of the personalities of New Zealand’s War in the Air from the First World War. Follow the journey of a prisoner of war in Europe during World War Two in this interactive exhibition which will engage visitors of all ages.